The 9/11 industry continues apace. The latest effort, arriving maybe a decade too late, proves quite the valentine (deserved or not, TrustMovies couldn't tell) to Cantor Fitzgerald, the firm that occupied several floors atop the World Trade Center and which lost between 600 and 700 hundred employees when the planes hit the towers. 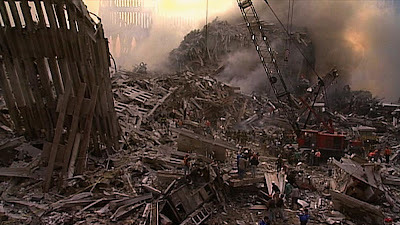 I happened to be in Greenwich Village that early morning, walking up 6th Avenue when the first tower fell. When I saw the sudden shock on the face a young woman who was passing me, I spun around to see the tower mid-fall, and that sight is indelibly fixed in my memory. But what our media and then-government did with this event, however, is unforgivable and always will be. How many hundreds of times did we need to see those planes hit and the towers fall before these idiots decided we were sated? And the Patriot Act? What a despicable and sleazy use of the "P" word, which, in any case, remains as always the "refuge of scoundrels." Now, none of this is the fault of Danielle Gardner (shown at left), the woman who made this documentary that has been hanging around unreleased for the past year or so. 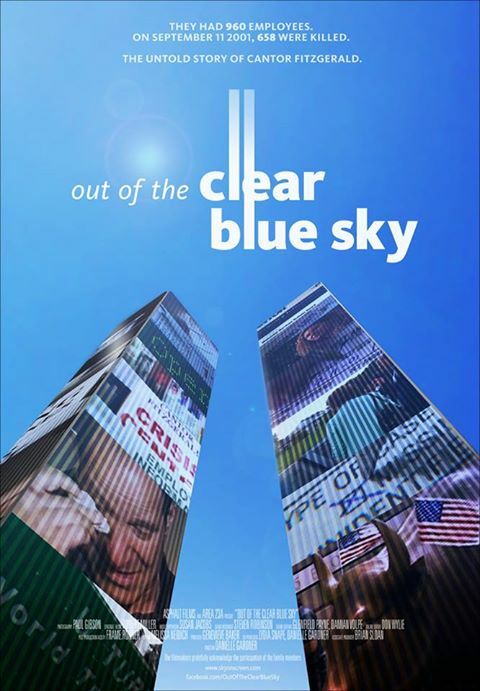 We are finally seeing a theatrical release happen now, on the 12th anniversary of 9/11. (I caught up with the documentary at a special screening yesterday in a conference room at the United Nations.) 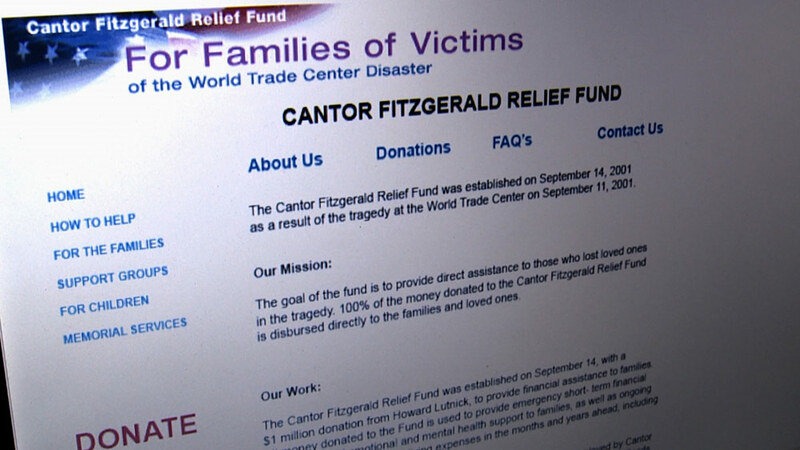 The film, after showing us all over again (and again) what happened -- yes: planes crashing, towers falling, the rubble aftermath -- concerns itself mostly with Cantor Fitzgerald and how its CEO Howard Lutnick (below) was turned by the media into a (very) tearful sort of mascot for the bereaved (he lost his brother on that day) who promised to aid the families of his lost employees, but then, when help did not come quickly enough, was turned on and vilified by that same, ever-caring media. 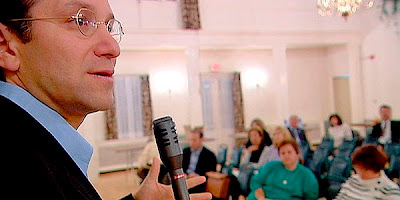 It's an interesting enough story, though Gardner sticks mostly to its surface, interviewing Lutnick and certain of his family members, and then a handful of Cantor Fitzgerald's affected families, who initially seem angry with Howard, only to come around later, as he begins to make good on his promises and they appear to understand that he, too, is grieving. 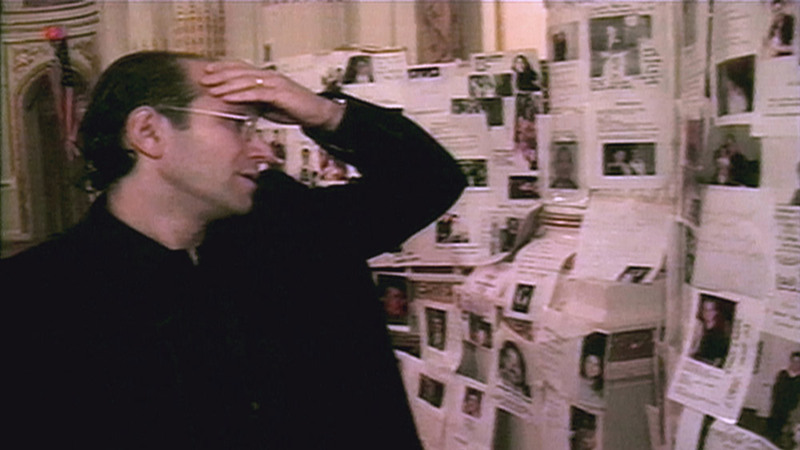 Lutnick himself narrates much of the doc's beginning, as he relives the story of that special day (he was taking his kids to school and so had not yet arrived at the World Trade Center), as Ms Gardner tries to keep up with him via her own visual effects. This is to no avail, for Lutnick proves quite the performer in his own right (you may wonder why he never became an actor, so animated, and clearly enjoying that animation, is he). 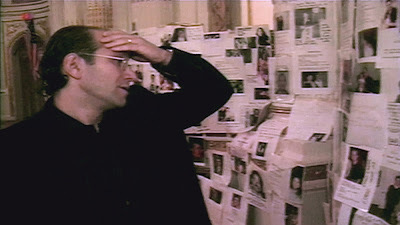 We see almost too much of his tears (little wonder he became the media's poster boy for concerned employers), the most convincing and telling of which comes when he looks at all the posted notices of missing Cantor Fitzgerald employees (above) and starts to reminisce about each. This is quite moving. 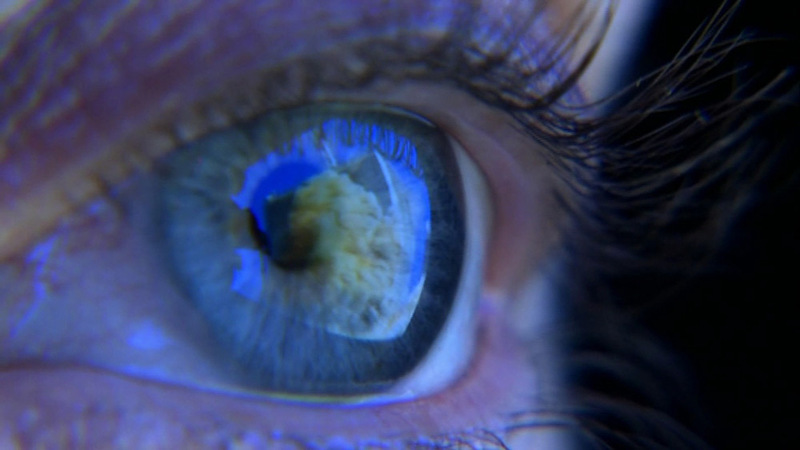 But the movie goes on and on and begin to repeat itself in some tiresome ways. Each time figures are given, they appear in white on a black screen and then disappear line by line so that we're left with only the last line that, of course, tells us of the final death toll. This happens over and over. Sometimes, even those figures are not quite true. 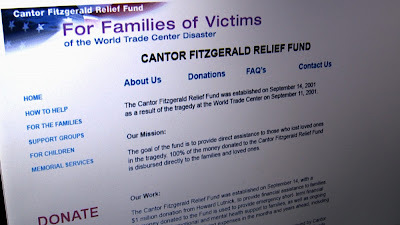 At one point, were told that 658 people went to work at Cantor Fitzgerald that morning -- but, no, many more than that figure actually went to work on 9/11. The 658 is used so that we can then be told: None of them survived. Please: we don't need this kind of induced, masochistic memorial. Yet the movie (above and below) mostly relives and relives so much we've already seen: Bryant Gumble and Larry King and all the rest. At one point, though, something odd and telling comes out, as we learn that J.P. Morgan did an accounting of Cantor Fitzgerald's books! Nothing is made of this, but it certainly sounds to me like the fox guarding the hen-house (or perhaps another fox's lair), but then the financial meltdown had not happened as yet, nor were we as privy as we now are to the wonders of the one per cent. Over time we learn of the CF Victim Compensation Fund, and at one of those yearly memorial services, we're treated to more speeches and tears. 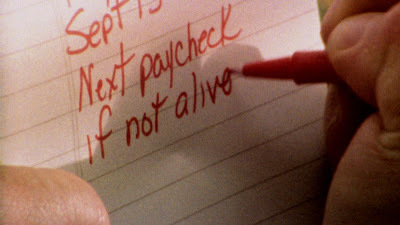 At film's end comes a surprise from Ms Gardner that shakes everything up. So far as I am concerned, this is something that ought to have been stated up front, rather than at the end of the film, for it calls into question her motives for making the movie. I suppose she wanted to tear us up a little more, but this may not have been the most intelligent way to do it. 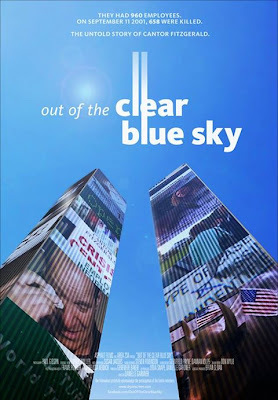 Out of the Clear Blue Sky, running 107 minutes (far too long for what it has to show and tell) will open in New York City tomorrow, Friday, September 6, at the Regal Union Square Stadium 14. It will have a number of special showings around the country -- 28 cities in 17 states -- this coming Wednesday, September 11. Click here (then scroll down) to see theater, time and how to purchase tickets.